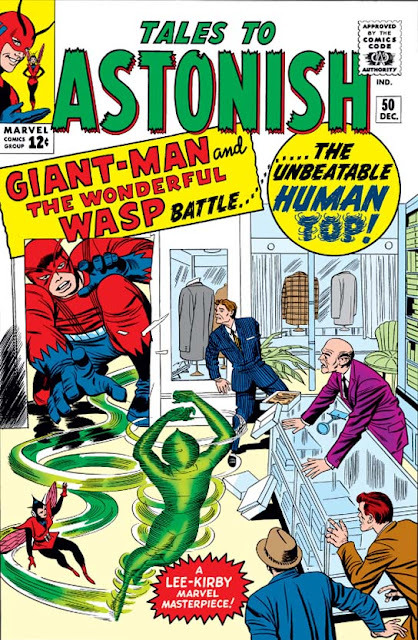 Hey, it's the fiftieth issue of Tales to Astonish! And how does Marvel celebrate this anniversary issue? Erm ... they don't. I mean, the splash page of the story proclaims it to be a "double-length spectacular", but at 14 pages it's clearly not. Note, however, that the story unusually ends on a cliffhanger, to be continued next issue. So was it originally designed as a full-length tale, taking up the entirety of the comic - but then for some reason Stan decided to split it in two after all, and put back in the requisite backup strips as normal? The bad guy this time round is Dave Cannon, the Human Top. Goofy in name, and goofy in deed. First we glimpse Dave as a young hooligan from years ago, terrorizing the neighborhood kids and stealing fruit. Growing up, he decides to cash in on his abilities as an ice skater ... but, still not satisfied, continues to commit crime in his off-hours. The character, in every regard, is entirely ridiculous - the kind of villain you expected to see Hank fight during his earlier issues, along the lines of the Protector or the Hijacker. If Stan was hoping to get the readership to take Pym more seriously, this was not the way to do it. What is interesting, though, are the strange, subtle personality developments we see starting to occur in Hank. Despite reading a newspaper that declares the Human Top to be "Public Enemy Number One" (seriously?! ), Pym declares the crook to be beneath his notice. When Jan hears of this, however, she immediately reprimands him for having a new giant-sized ego as well, which seems to jolt him out of his complacency. After an attempt at capturing the Top which sees Giant-Man walk into signs, crash through property, and essentially trip all over himself, Pym goes back to the lab and creates a training regimen designed to increase his speed and reflexes, instead of just his height. Although the initiative is sound, we can detect a slight hint of the inferiority complex that drove him to create the Giant-Man guise in the first place, and the seeds for his later mental instability are in surprisingly clear view. to see what they look like in a mirror.